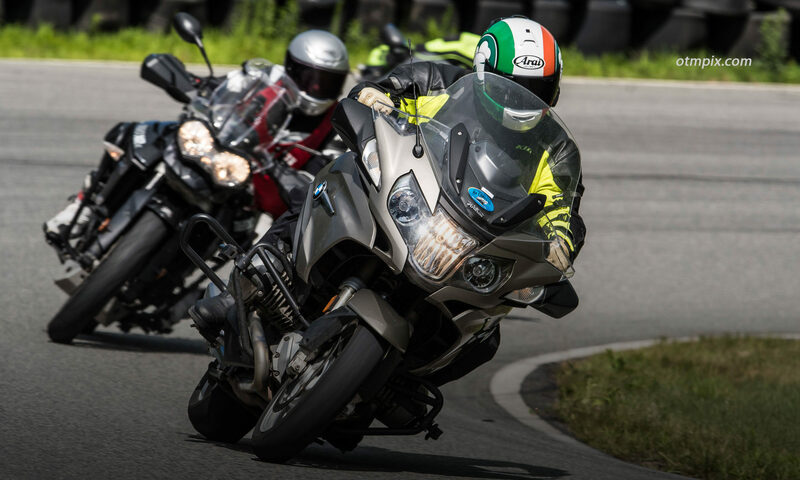 A recent study by the California Office of Traffic Safety reports what many motorcyclists already know; that lane splitting is (or, can be) “safer” than sitting in stopped traffic. This means being less prone to serious injury. To enjoy the safer status, riders must only splitting lanes when traffic is moving at 30mph or less and when the rider travels no faster than 10 mph more than surrounding traffic. The study also confirms another suspicion that lane splitting benefits all road users by reducing the number of vehicles adding to traffic congestion. Yeah, us! For those of you who aren’t motorcycle riders or who live in one of the 49 states that don’t allow lane splitting, you may not know what lane splitting is. As the moniker suggests, lane splitting is when a motorcycle rider rides between two lines of cars heading in the same direction, like when riding on a multi-lane highway. Riders split lanes on the highway when traffic slows. But, they are also known to split lanes as they filter to the front of stopped traffic at a stop light. Lane splitting will more likely be tolerated if it is done with respect. Filtering through traffic, whether on a multi-lane highway or local arterial means there are fewer vehicles clogging up the works and if done at low speed, is relatively safe for the motorcycle rider if done correctly. The primary reason for motorcyclists to consider lane splitting is that it puts the rider in a less vulnerable position. Being rear-ended by a four-wheeler is a sure-fire way to end up in a hospital bed and that’s not even talking about the possibility of being sandwiched between two cars! However, lane splitting has a totally bad rap because some riders do it wrong. Proper lane splitting is done at a speed no faster than 10mph beyond the travel speed of surrounding traffic. Unfortunately, some riders zip between cars in a way that is dangerous and scares the hell of those they pass. This unwelcome behavior can incite resentment from drivers and further reflect badly on all motorcycle riders, even those who split lanes safely. Some irate drivers have been known to close the gap as the rider attempts to squeeze past. Here is the rub. Even though the study confirms (through statistics) that lane splitting reduces instances of cars colliding with a motorcycle, it also says that there is an increase of motorcycle riders rear-ending other vehicles. This is where the speed factor comes in. It doesn’t take a government study to know that ripping between slow moving cars is a bad idea. The study clearly states that the safety benefit applies only to riders who lane split at 10mph or lower. The study confirms another seemingly obvious assumption; that it’s not safe to split lanes when traffic is traveling above 30mph, so ride slowly as you filter, please! Even with the study, a lot of riders I know still do not think it is a good idea. I suspect it’s because they have never done it and they can’t imagine drivers in their state tolerating a maneuver that has always been considered illegal and irresponsible. Just for reference, lane splitting in other parts of the world is not only tolerated, but expected. Check out this PSA from Australia in favor of lane splitting. Make sure your luggage and mirrors can fit between vehicles. What follows are tips from my perspective. I may be a reasonably intelligent motorcyclist, but I have little experience splitting lanes. Last year, the CHP put out a guideline for motorcyclists, but it was taken down after someone complained, so that resource is not available. Which means I could use some help from my Cali-friends. Use the comments section below to add your thoughts. For those of you not riding in California, you may want to keep these tips filed away for the day when lane splitting is made legal in your state (don’t hold your breath, though). In the meantime, consider writing your lawmakers to encourage pro lane splitting legislation. Lane split only when traffic is moving at 30mph or less. Set your speed at or under 10mph faster than traffic. Be patient! Lane splitting should be thought of as a privilege and be respectful. Resist frightening drivers by keeping your speed down. You wouldn’t want to trigger road rage. You’ll lose. Know your bike’s limits. Those wide hard bags and mirrors you love so much will cause a serious problem if you try to squeeze into a too narrow gap between two vehicles. If in doubt, wait until there is enough room to proceed. Avoid blind spots. Lane splitting means you will be riding close to vehicles’ fenders and in drivers’ blind spots. By filtering forward at 10mph faster than surrounding cars, you will ride THROUGH blind spots, which is good, but be aware of the danger of lingering in a blind spots when you have to slow. Be extra careful when riding near large trucks and RVs. Keep an eye out for cars changing lanes. Seeing an opening in traffic should put you on full alert for cars moving across your path. Also, be aware of approaching exits where drivers may suddenly change lanes. Watch your mirrors for other lane splitting riders. Move over for riders splitting faster than you. Be courteous to slower lane splitting riders. Don’t tailgate your fellow riders. Move back into a lane once traffic begins to match your filtering speed. Remaining in between lanes with other vehicles moving at the same speed is asking for trouble. Rejoin traffic when possible. Keep your eyes scanning well ahead. Okay. It’s your turn. Please use the comments area below to share your thoughts on lane splitting. Is Crashing Really that Bad? Having split lanes for many years when I lived in the UK, I have one additional tip..
Be extra careful if splitting lanes in the wet. Road markings are often slippery and you will bee passing within inches of other vehicles. If the front end slides on a marking in such close quarters the consequences could spell disaster! I really do wish it were legal to lane split in all States, but I don’t see anyone really pushing that agenda, including the AMA…however, I do like the idea of writing to my legislators in New York. Would it be OK to print this blog piece and attach it to a letter? One thought I had while reading this is loud pipes. If you ride a loud bike, you may very well scare the bajeezas out of a car driver, especially in the summer when windows are down. Scaring leads to anger, and bad consequences. Keeping the RPMs down will help, but if your bike is really loud, you may wish to “pass” on passing! Jeffrey, there ARE people trying to do something about it. Look up the NYMSTF or the New York Motorcycle and Scooter Task Force. When given the option, I’ve seen recommendations to split between the two “fastest” lanes where cars will only be changing lanes and not turning onto new roads. If possible, avoid the “bicycle lane”. For those opposed to lane splitting in, say, a normal freeway traffic situation, please think of those times when you’ve been stopped hopelessly for construction or an accident, with the relief of an exit just a short distance ahead, but you can’t legally ride there. Wouldn’t it be better to let bikes split lanes to exit and find another option more pleasant than sitting dead in the water on a 90-degree summer day? Can you guys stop using the term lane splitting. As someone who has been trying his damdest to get lawmakers to look into the matter there are too many people calling it lane splitting, and worse yet white lining. All of out paperwork, meetings, briefs and documentation uses the term filtering. It would be great to show them articles, such as this one, but it would be better if written articles used terms that sounded more palatable to laymakers and congressman. Thanks for the heads up, Ed. 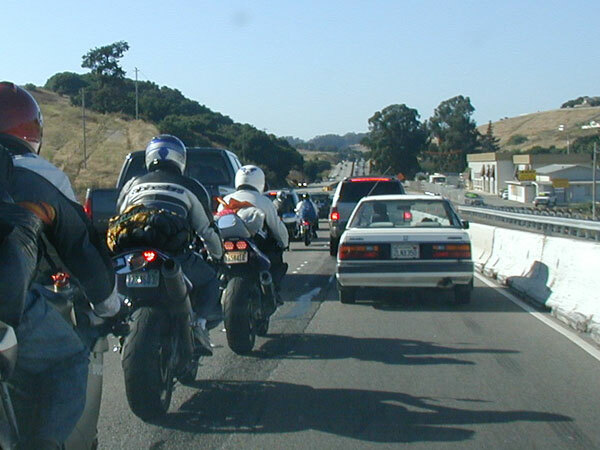 The California OTS report did NOT conclude that lane-splitting riders are less likely to crash. It found that those who DO crash suffer fewer injuries than riders in non-lane-splitting crashes. Because “non-lane-splitting crashes” includes every other kind of motorcycle crash, it’s an apples-and-oranges comparison. The question not answered (yet) is whether, in stop-and-go freeway traffic, it is safer to split or to occupy a lane. The question isn’t as simple as it seems. While splitting alleviates the risk of being rear-ended, it introduces risk of its own. Riders who know how to limit lane-splitting risk probably are safer. Those who do not, probably are not. The statistical answer to the unanswered question, then, will depend very much on the skills and attitudes of the splitting population. That’s correct…not any less likely to crash, but less likely to be injured. The photo in Ken’s post shows splitters with about one wheel spacing between them. By far the most common lane-splitting crash occurs when a vehicle changes lanes across the splitting corridor. This can lead to a rear-ender, a sideswipe, or crash under braking. To guard against it, a splitter must look several car-lengths ahead and be prepared to brake in response to an incursion. One splitter following three feet behind another will not be able to react in time if the splitter ahead must brake. I know of three lane-splitting deaths in the past three years caused by tailgating splitters. This isn’t just a hypothetical danger. So, safer from being rearended but not safer from side swipes depending on space and speed(almost impossible to enforce this in heavy traffic). I would say why not keep things simple and just not do it. Apparently 49 other states feel the same.